In the Conger Complex horses are an invasive species. Before the Wild Horse & Burro Act of 1971 local ranchers and horse runners would have managed these horses well and profitably. 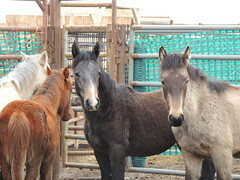 The BLM is doing their best to manage these horses in a multiple use area but does not have the advantage of unrestricted sales or the resources to manage these horses at the level that is needed. The Act of 1971 legally made these horses an integral part of the natural system of the public lands , but it didn’t change nature. Watch to video and see if you think the horses should be here. They are managed horses, not wild.